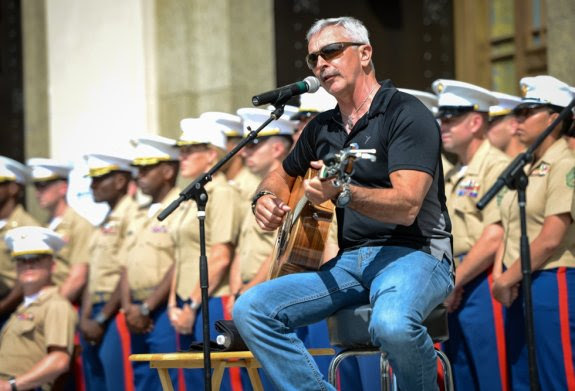 Smash Hit Song, "Where The Stars And Stripes And The Eagle Fly"
Nashville, Tenn. (August 12, 2016) - Country music star Aaron Tippin was on hand to perform at Wednesday's press conference announcing Marine Week inNashville, taking place September 7-11, 2016. 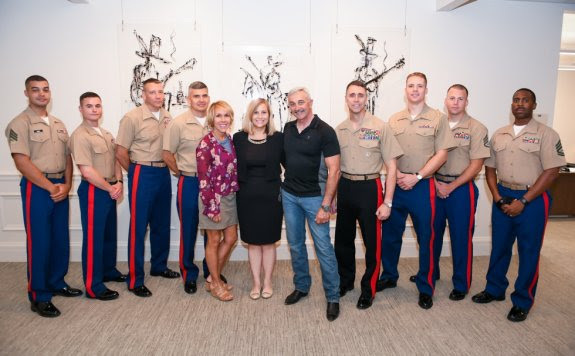 Tippin joined several dozen Marines and Mayor Megan Barry at the press conference, playing an acoustic version of "Where The Stars and Stripes And The Eagle Fly." "I was so honored to be asked to sing at the announcement of Marine Week," says Tippin. "We can't do enough to show how much we appreciate these guys and gals who help defend our freedom." More than 700 Marines will descend upon Nashville at next month's event. Throughout the week, the public will have the opportunity to climb aboard a variety of the Corps' aircraft and ground equipment at static display venues throughout downtown, to include the MV-22 Osprey aircraft and the multifaceted Amphibious Assault Vehicle. People of all ages are invited to attend Marine Corps martial arts and military working dog demonstrations, work out alongside Marines during physical fitness demonstrations, and take in the sights and sounds of the Marine Corps Silent Drill Platoon and Marine Band San Diego. The event's theme of "Community, Country and Corps" will offer more than 80 free, public events across the city. The opening ceremony, which is also being held at Public Square, will kick the week off on Wednesday, Sept. 7, at 6 p.m., and will feature a musical performance by country music starDarryl Worley and a special presentation and remarks by Barry.